Four pre-adolescent boys attended a recent advance screening in Revere. They may as well have been the protagonists of the kids’ sci-fi adventure film they’d just seen, “Earth to Echo,” and likely longed for the same kind of trouble its gang of boys got into. Given today’s parenting styles, the boys who’d just seen the film are probably more sheltered than their counterparts in “Earth to Echo,” who recall the heroes of such 1980s staples as “E.T. the Extra-Terrestrial,” “The Goonies,” and “Stand by Me” — kids who bust free from the watchful suburban gaze of their families, going by foot or BMX bike into the wild, in search of aliens, or buried treasure, or more. Times have changed. All the more reason for a throwback film like “Earth to Echo,” opening Wednesday, which conjures up the same kid-centric, kid-driven adventure spirit of “E.T.” and its ilk. But with the exception of J.J. Abrams’s “Super 8,” which dipped its Cup of Nostalgia heavily into the same Spielbergian waters three summers ago, these sorts of films don’t get made anymore. “Super 8,” which is set in 1979, was “very much built for the nostalgia of people my age,” Green said, and his film is also a conscious homage to that era. In “Earth to Echo,” three preteen pals, Tuck, Munch, and Alex, get one final night together before their families move away. Then they begin receiving strange signals on their cellphones, which lead them on a scavenger hunt-like expedition into the desert. As the boys find a stranded alien, which they name Echo, bits of a bigger puzzle are slowly revealed. Echoes of ’80s adventure movies can be heard everywhere in “Earth to Echo.” The pirate map from “The Goonies” is replaced by iPhones. Instead of the Oregonian “Goon Docks” neighborhood, which faces foreclosure because of the construction of a country club, the boys’ small Nevada suburb is slated to be razed for a mysterious highway project. The mistrustful government scientists in “Earth to Echo,” wielding flashlights and jingling key rings, are nearly identical to those in “E.T.”, and are perhaps equally up to no good. Soon, just as in “Stand By Me,” the gang becomes acquainted with deepening friendship, and what it means to do the right thing. 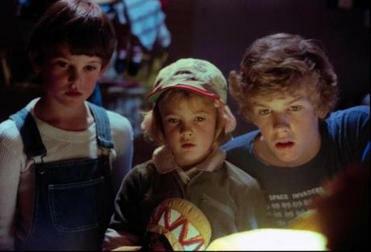 Related themes are also found in films such as “American Graffiti” (a group of friends’ last night together), “Close Encounters of the Third Kind” (government coverup of aliens), “The Outsiders” (tough boys living on their own in a hideout), and “Iron Giant” (boy befriends and protects robot from government forces). These plots also hinge on the interplay between faceless suburbia and adventure. How far from the cul-de-sac and manicured lawn can kids still find the unexpected? 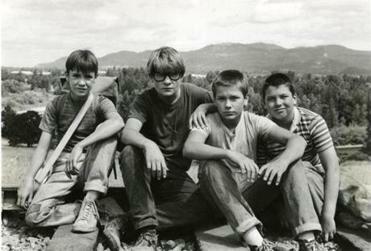 Or in the case of “Stand By Me,” a dead body? 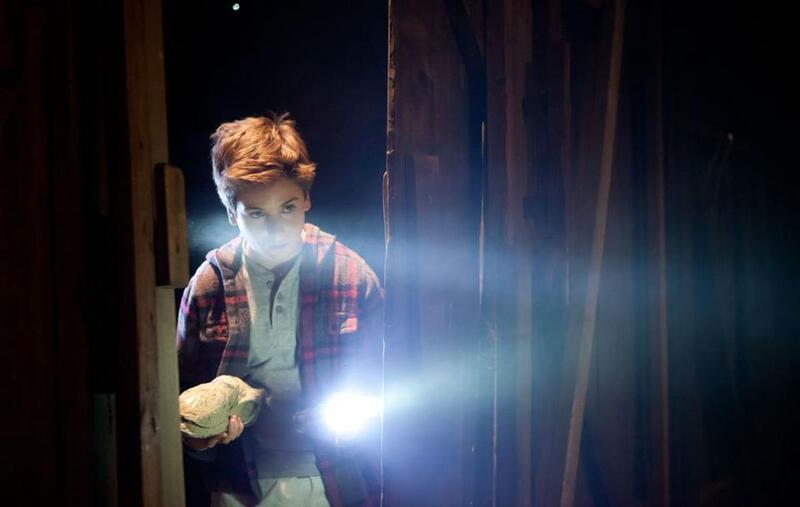 Elliott, a loner who seems to have no friends of his own, worries the scientists will give E.T. “a lobotomy or do experiments on it or something,” and protects the alien from parents, the military, and government, all of whom see aliens as a threat. The boys in “Earth to Echo” feel a similar connection to their spaceman, who makes R2-D2-like chirps and beeps. Like Elliott, the outcast foster kid Alex makes an emotional bond with Echo. Like Mikey (Sean Astin) in “The Goonies,” Tuck is the pack’s earnest leader; the nervous Munch is a hybrid of geeky Data and goofball Chunk. All feel like strangers on earth, and let down by the adult world. Echo, Alex says, is “lost and alone, on its own, just like us.” Meanwhile, Moms or Dads are too harried holding together their single-parent lives. Think of the many times the mother in “E.T.,” nursing her own heartbreak, is too checked out even to notice the weirdness (or outer space creature) around her. Kids slip through the cracks. They are unsupervised and in control of their own risky secret mission. Sneaking along underground passages and hidden bike paths, by their wits they outsmart grown-ups, who are realistic obstacles, not cartoon villains. Likewise, the kids aren’t superheroes with superpowers. They’re just ordinary kids. The kids in “Earth to Echo” do their best to distance themselves from adult cynicism. Because you never know: An alien or treasure map might bring meaning to their world. To be sure, there is magic in special effects — who can forget the flying bicycles of “E.T.” — but true magic stems from testing the limits of risk and pushing the bonds of friendship. The mix of mundane and miraculous suggests similar adventures could happen to you, too.